Earlier this week, KC Shaw started a meme about an early book memory and asked others to do the same. It's taken a few days but here's mine. Behold the beauty that is: The Children's Wonder Book. The book dates from the 1930s, although I'm not that old (Phew!). It's enscribed 'To Alfie & Eileen From Mother & Dad For Xmas 1933', and I have no idea who they are though they are probably one of my Mum's cousins (she had hundreds - almost). It is then further inscribed: 'This book belongs to Pat Rendell 2/12/1948' - ie, my auntie, who then passed it onto my Mum who passed it onto me in the 1970s. The book is battered, pages are coming loose and there are ticks alongside my favourite stories on the index page. I was a book vandal. But I was a book vandal who loved this book very much. 'The Children's Wonder Book' was a fabulous way to introduce a child to fiction. 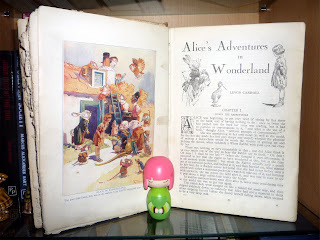 It includes Alice's Adventures in Wonderland (see above) with illustrations by the fabulous (and famous) artist Harry Rountree, alongside Tales of Robin Hood, The Frog Prince, The Ugly Duckling, Sinbad the Sailor, Aladdin and his Wonderful Lamp, The Water Babies, Robinson Crusoe, Gulliver's Travels, A Christmas Carol, The Snoring Ghost, Little Snow-White, Hansel & Gretel, and The Legend of Sleepy Hollow. Plus lots, lots more including poems. It's a big, big book, but I don't ever remember it being heavy, even when I was small. Is it any wonder I love books so much. What a wonderful book! You can see the love all over that cover. I destroyed most books when I was a child as I read them over and over and over. Very cool looking book. I wonder if I could find a copy on e-bay for my own library? Jamie - Probably, ebay has everything. If you do find one keep it safe. I used to sell prints (and adverts - don't ask) on ebay and the Harry Rountree illustrations used to go for a very decent amount of money. How completely cool! The illustration in your photo is wonderful, too. You're lucky you still have the book; one of my very favorite books from when I was tiny disappeared over the years, and it's only available as an extremely expensive used copy online. I'd hate to lose it. I also have my brother's Golden Wonder book (which isn't as cool, quite as old or as destroyed - he didn't love books like I did) and my Faraway Tree books. Don't know what happened to all my Famous Five & Secret Seven books though. Probably gave those away. I have a lot of old books, and I love everything about them, right down to their damp, moldy smell and brittle pages. There is something so very special about old books. You hold them in your hands and it's like they contain the history of the world, beyond what is simply written across the pages. Who held this book before me? Where are they now? What did it mean to them? My book thanks you. And you're right, it does have a certain smell. I love these kinds of things so hard, thanks for that post! I spent a few nights in India looking at similar books my husband had from his childhood, and I love to steal my old ones from my parents. That book looks amazing...it reminds me of one my grandparents had when I was little, only it was much newer than that one. Fantastic! Must tap into this... I've lost some that I would love to still have, though I do have the ones that I learned to read from - Winnie The Pooh and my mother's battered copy of Alice In Wonderland. But I remember them all as the most constant friends I had. 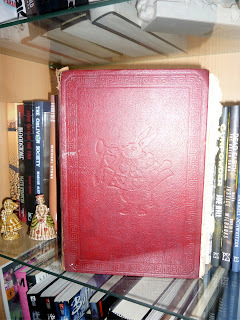 Katey - I still have my brother's book which is very similar to this. (Shush - don't tell him). Jodi - this book was much newer until I got my greedy little hands on it. Ian - I've never read Winnie-the-Pooh, I was always a Rupert the Bear gal. There could be a story in the story...how did the book get to the first owner and was it by accident or was there a reason it ended up in your hands....?? ?